It’s not just visitors to the island, but also locals, that often don’t realise just how special and treasured the island’s religious heritage really is, with a whopping ten churches on the official UNESCO Heritage List. 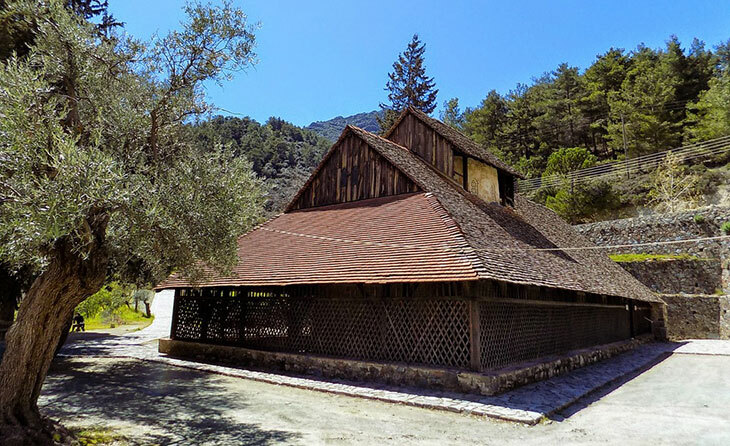 Nestled within the greenery of the Troodos Mountains (in the Pitsilia, Solia and Marathasa region) they were built and painted between the 11th and 16th centuries, made from ‘unfinished’ local stone. A real Byzantine treasure trove, the buildings have remained largely unchanged for centuries, standing proud as one of the greatest concentration of churches of the former Byzantine Empire. And once you step inside these quaint buildings, you’ll find yourselves ogling at colourful frescoes depicting scenes from the Old and New Testaments, saints and sinners and, interestingly enough, portraits of the earthly patrons and ladies of the church. Floor to ceiling, wall to wall, the images can be overwhelming at first. To really appreciate the artistry on display, stop a minute, catch your breath and then, slowly, take in all the grandeur. Here are a few My Cyprus Insider favourites that you simply must take the time to visit! A truly stunning building which appears bigger than it is from the outside, what’s really unique about this little church is its steep-pitched roof which extends beyond the main structure on three sides, with a wooden trellis concealing the building within. And that’s not to forget the other equally impressive and unique feature with the dome covered by a separate wooden roof; something unique amongst the churches of Troodos. Seemingly built as part of a monastery, this time in the second half of the 12th century, the monastery itself survived until the 19th century. Other sources, however, seem to indicate that the church may have been a private chapel. Today, a two-storeyed monastery building survives to the north of the church used as a priest’s residence. Have a look at the inscription above the north entrance and you’ll see that the church has been decorated with the donations of Leon Afthentis in December 1192. Have a good look around at the rather exceptional frescos inside and take note: this church houses some of the finest examples of Comnenian style frescos in the Orthodox world and certainly the most complete series of Middle Byzantine frescos in Cyprus! Do note that if you can’t get into the building and the door is locked, the priest can usually be found next door. About two kilometres south west of the popular Kakopetria village, a little church built in the 11th century calls out for attention, standing as the only surviving katholicon (monastery church) of an 11th century Byzantine monastery on the island. While the monastery ceased to function at the end of the 19th century, this little place took on the role of a simple country church and pilgrimage site. 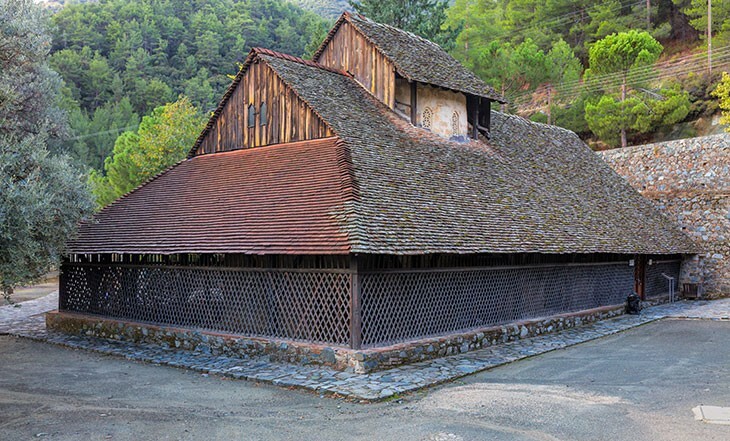 With its steeped pitched roof a real site to see, made from a flat tile common in the Troodos area, its name ‘tis stegis’ directly translates to: ‘of the roof’. 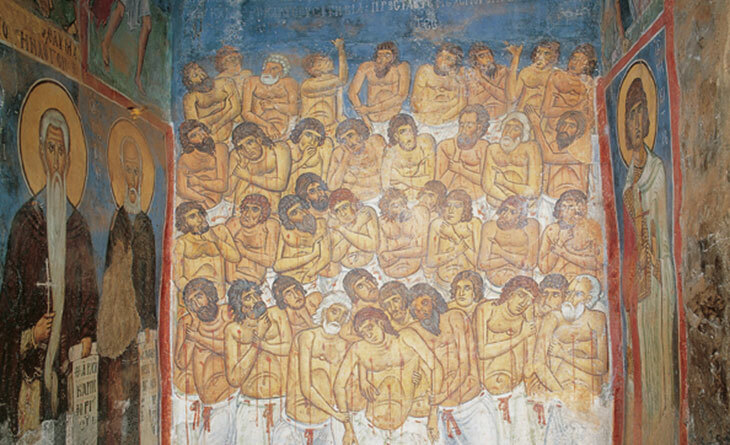 But it’s not just the outside that’s a site to see, with the interior often hailed as a museum of Byzantine painting. Step inside to ogle at an inside space decorated with frescoes that cover a time span of about 600 years, with the oldest part of the mural decoration dating back to the 11th century and hailed the most significant wall painting which survives on the island from this period in time. 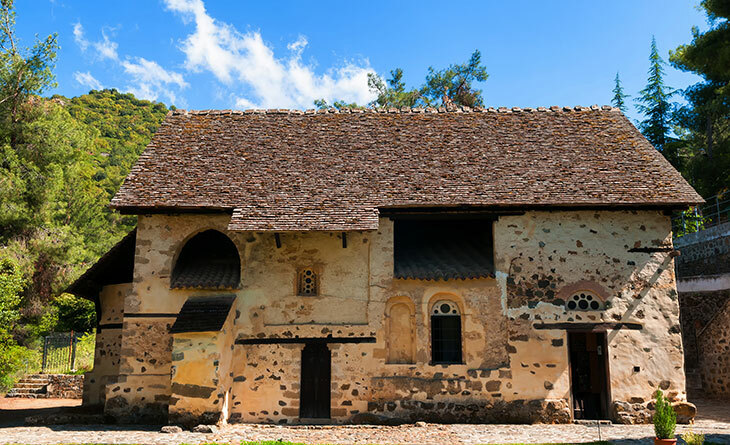 With Kalopanayiotis having become a real hot spot with locals and foreigners alike, one of its key attractions is Lampadistis Monastery, which is one of our absolute UNESCO church favourites. A complex made of three little churches dating back to the 11th century, the building is dedicated to a young monk named John Lampadistis buried on the grounds. Legend has it that a man suffering from epilepsy once touched the grave and was miraculously cured. News spread quickly across the country, and his tomb has been credited with special healing powers. Sit for a breather in the courtyard of the complex to take in all the history, while the interior of the monastery itself is rather awe inspiring with its well preserved colourful and intricate frescoes and icons. 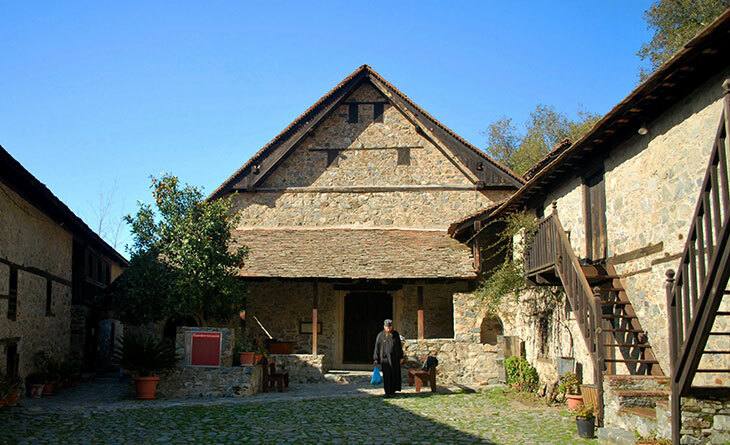 Be sure to also pop round the corner into the Byzantine Museum which houses countless ecclesiastical artefacts that have survived through the centuries in the monastery and the other village churches. 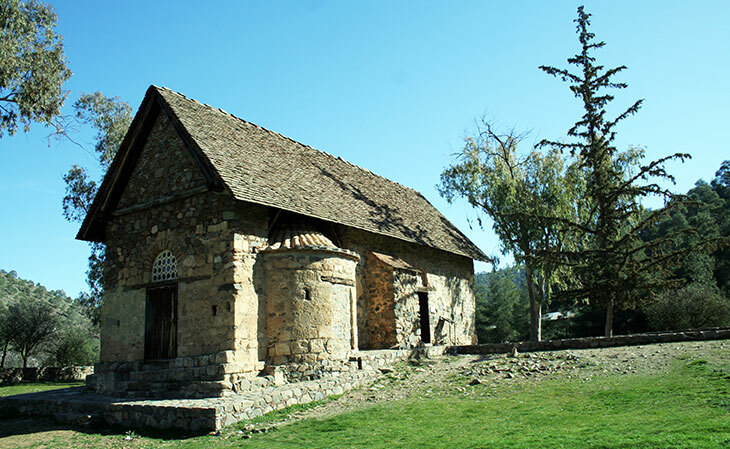 Three kilometres south of the village of Nikitari on the north foothills of the Troodos mountain range, this church used to be the monastery church of the Monastery of Forbion. Built with the donation of Magistros Nikephoros Ischyrios, he then became a monk known by the name Nikolaos. While no traces of the monastery survive today, it’s known that it was built in 1099, and was abandoned at the end of the 18th century. Step inside the church and you’ll be looking left and right, up and down, taking in the splendour of a place covered in wall paintings. With some dating back to the 1100s, they beautifully reflect Comnenian period style. -Panayia tou Araka, Lagouderia: 9am- 12 noon and 2pm- 5pm daily. Closed on public holidays. -Agios Nikolaos tis Stegis, Kakopetria: Closed on Monday and public holidays. Weekdays and Saturdays: 9am-4pm. Sunday 11am-4pm. -Agios Ioannis Lampadistis, Kalopanayiotis: Closed on Monday and public holidays. Weekdays and Saturdays: 9am- 1pm and 2pm-5pm. Sunday: 10am-1pm and 2pm-4pm. – Panayia tis Asinou, Nikitari: Weekdays and Saturdays 9.30am-4pm, Sundays and public holidays 10am-4pm.